"Behind-the-scenes" stories of ranting directors, stingy producers, temperamental actors, and the like have fascinated us since the beginnings of film and television. Today, magazines, websites, television programs, and DVDs are devoted to telling tales of trade lore—from on-set antics to labor disputes. The production of media has become as storied and mythologized as the content of the films and TV shows themselves. 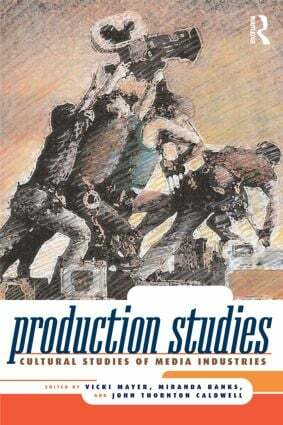 Production Studies is the first volume to bring together a star-studded cast of interdisciplinary media scholars to examine the unique cultural practices of media production. The all-new essays collected here combine ethnographic, sociological, critical, material, and political-economic methods to explore a wide range of topics, from contemporary industrial trends such as new media and niche markets to gender and workplace hierarchies. Together, the contributors seek to understand how the entire span of "media producers"—ranging from high-profile producers and directors to anonymous stagehands and costume designers—work through professional organizations and informal networks to form communities of shared practices, languages, and cultural understandings of the world. This landmark collection connects the cultural activities of media producers to our broader understanding of media practices and texts, establishing an innovative and agenda-setting approach to media industry scholarship for the twenty-first century.